It’s not that my granola tastes bad. Not to toot my own horn, but most recipes are actually pretty good. Delicious even! But I find myself wanting to make granola less and less and it seems like a hassle. The steps are easy–mix dry ingredients, mix wet ingredients, mix together, bake, enjoy–but it’s the beforehand that’s become such a project. The ingredient gathering. For the longest time I had the notion that in order to make great granola you had to toss in everything but the kitchen sink. Fruit, nuts (multiple types, of course), flax seeds, oats, coconut, chocolate. And then there’s the wet mix–a perfectly composed combination of no less than 5-6 oils and sweeteners. I never had everything around when needed, so I’d put off the recipe for weeks, leaving us with a granola-free home or forcing us to spend far too much on the pre-made stuff. 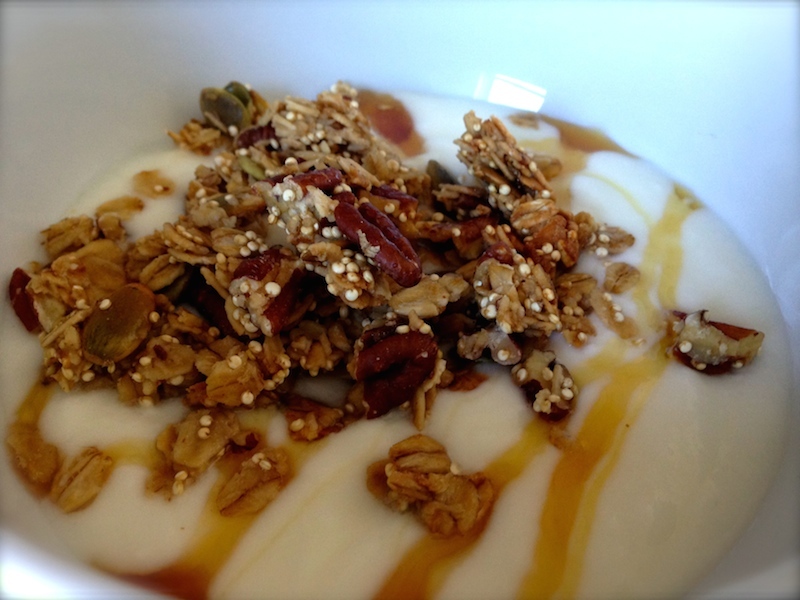 After seeing the ease of these other granola recipe, I decided simplicity was the way to go. Buzzfeed provided me with a simple, fool-proof granola formula to work off of. After that it was just a matter of selecting the perfect, simple combination of ingredients. My biggest take away from this recipe was the addition of egg whites. Something I’ve never seen before in a granola recipe, the stickiness of the frothy mixture helps the granola clump more. One egg white plus resisting the urge to stir the granola while baking left me with an almost sheet of granola, that I was then able to break apart by hand into what I deemed bite-sized. Preheat oven to 300°F. In a large bowl, toss together oats, quinoa, pepitas, pecans and salt. In a smaller bowl, mix honey (microwave honey for 1 minute if too thick to stir), canola oil and ginger until emulsified. Pour wet ingredients over dry ingredients and mix well with a wooden spoon. Drizzle egg white over mixture and stir again. Evenly spread granola onto a parchment-lined rimmed baking sheet. Bake granola for 30-40 minutes or until it looks toasty and browned and your kitchen smells AMAZING. Let granola cool completely before breaking apart chunks and storing in an airtight container. Enjoy by the handful, with milk or over yogurt with an extra drizzle of honey. Thanks Laura. I suggest doubling the recipe. This stuff is good and goes FAST! I have heard about the egg white trick but wasn’t sure if it would work and imagined pieces of egg white on my granola, clearly that doesn’t happen. Love the recipe and I need to make some granola. I’ve never heard of the egg trick either! But obviously it’s the right way to go because this granola looks great! Thanks Mary. I was a bit skeptical too but it really worked wonders! Thanks Thomas. It’s become a go to. I’ve made it at least 2-3 times since perfecting it!